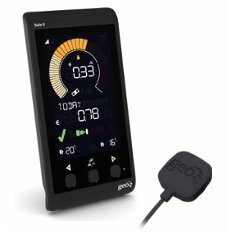 Please be aware the Geo Solar Solo II PV Monitor requires a generation meter with a pulse to function, and this is not the unit supplied with a CT Clamp. The GEO Solar Solo PV Monitor comes with a colour, backlit screen. It provides live generation information to the user giving a clear picture of how well their PV array is performing. This information can be shown as money earned via feed in tariffs (FITs), kilowatts generated or the amount of CO2 saved. The display also shows generation over the course of the day, yesterday and the last 7-days. Utilising an LED reader that attaches directly onto the outside of the generation meter, the Solo PV is simple to install. The LED reader then plugs into a transmitter, which is pre-paired to communicate wirelessly with the display which can be located wherever required within the home. As the Solo PV works independently of the inverter, it will work with the majority of OFGEM approved generation meters providing flexibility of choice for installers. Designed specifically for the PV market the Solo PV indicates when the array is producing enough energy to power high load appliances (such as dishwashers and tumble dryers). Ensuring power generated via panels is used efficiently.